Ready for a unique and talented take on a wide range of musical traditions? 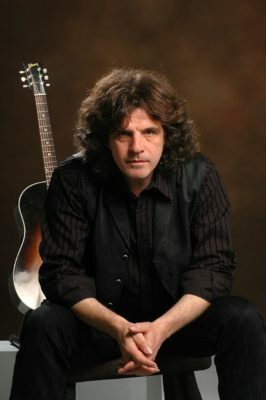 Claude Bourbon is known throughout Europe and America for amazing guitar performances that take blues, Spanish, Middle Eastern, and Russian stylings into uncharted territories. Each year Bourbon plays more than 100 shows around the world. Claude has played countless venues, including Glastonbury Festival, Isle of Wight Festival, Colne Great British & Blues Festival, Rock O’Z Arene, Avenches, Switzerland, among others. He has shared the stage in Europe and the USA with countless musicians, Calvin Russel, Charlie Morgan (Elton John, Gary Moore), Jan Akkerman (Focus), Steve Grossman (Miles Davis), Herbie Armstrong ( Van Morisson), Jose barrense Dias and many more. Now based in the UK, some of this guitarists’ influences allow us a fascinating insight into this remarkable musician; Paco De Lucia: Deep Purple’s Richie Blackmore; Joaquin Rodrigo; JJ Cale, Monty Python; JS Bach and Fleetwood Mac’s Stevie Nicks….